Melaleuca ericifolia is a tall shrub or small tree and is known as the Swamp Paperbark. Bark is papery and grey to brown. Juvenile growth is bright green. Adult leaves are dark green, linear and up to 15 millimetres long. Flower-heads are dense, terminal, cylindrical, white to cream and about three centimetres long. Flowering occurs in spring and is usually bountiful. Many insects, including flower wasps, native bees and various beetles, are attracted to the flowers. Prune behind the spent flowers to keep plants from becoming straggly. 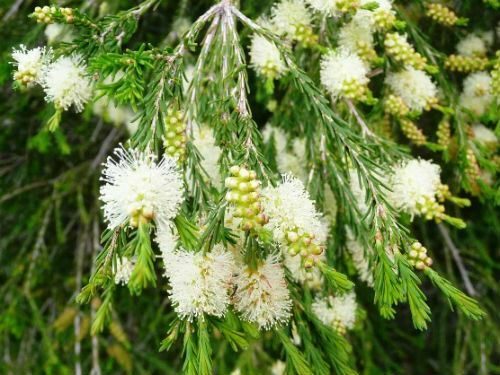 Melaleuca ericifolia is found from the north coast of New South Wales through Victoria to Tasmania, including King Island, usually in coastal areas. The Swamp Paperbark grows along watercourses and will form dense thickets in wetlands. In our cold climate garden the Swamp Paperbark survives, thrives and flowers bounteously in dry, well-drained situations. Melaleuca ericifolia could be incorporated in native hedgerows as well as shelterbelts and windbreaks. Propagate from seed and cuttings. We prefer cutting propagation because these plants flower considerably sooner than seed grown specimens. Melaleuca ericifolia is mentioned in the Linnean Society of London Journal of 1797 by Sir James Edward Smith, a noted botanist of that era. He founded the Society and also named Melaleuca ericifolia. His author abbreviation is Sm or sometimes Smith. He thought that the dried leaves of Swamp Paperbark tasted like Coriander seeds.